Sat, Feb 9, 2019, 06:50 pm SL Time, ColomboPage News Desk, Sri Lanka. Feb 09, Colombo: The police have found Kerala Cannabis in a vehicle said to have been used by actor Ryan Van Rooyen, who was arrested along with Makandure Madush in Dubai. The Weligama Police found the vehicle, while it was parked at a holiday resort in Mirissa and upon search of the vehicle found 5.75 grams of Kerala Cannabis in the vehicle. The brother of Amila Prasanga Hettihewa alias "Sunshine Sudda", another suspect arrested in the Dubai raid has confirmed to the police that the vehicle was used by actor Ryan. The Dubai police have also arrested the owner of the resort "Suranji Sudda" along with Makandure Madush and several others. The vehicle was registered in the name of a woman in Uswetakeiyawa area in Wattala. Weligama police are conducting further investigations. 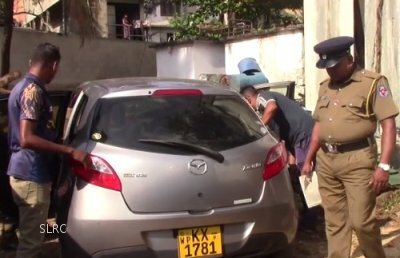 Meanwhile, Padukka Police, on information received, have seized a vehicle said to be belonged to the mistress of Makandure Madush at a house in the Poregedara area in Padukka. It is said that this vehicle had no license. The owner of the house and his son have also been arrested.